Hope you are all enjoying the spring like weather we have been getting. And the little hints of old man winter popping his head up here and there. There are a few things I would like to say before I get on with this week’s Injury Report. This week’s blog post is more on the post rehab side than trying to fix the problem muscular wise, the initial problem is muscular, however, when this goes it is far too late, the muscular imbalance is so off that it just pops, or you have been hit so hard that, again, it just pops, and you and everyone around you knows it. It is the most common, loud, and painful knee injury there is. Anyone who injures this part of the knee is in for a very long, painful, and stressful ride that includes: surgery, physio, rehab, and post rehab just to get back to where everyone else is. There’s no shaking that at all. You are out for at least 6 weeks. Like I said above the ACL/PCL injuries are one and one alone: you tear them. That’s it. You cannot “stretch” ligaments because they have the tensile strength of stainless steel. Yes, they are that strong. Now before we get into all the fun stuff like exercises to strengthen the area of the knee that supports the ACL PCL let’s sum up from last week at how the knee is designed, how it takes and distributes load, and what protective mechanisms it has. Just bear with me here folks this information I know we looked at this last week but it is very important when trying to design exercises to strengthen the knee after, and only after, rehab is complete. The knee is made up of four bones (femur, tibia, fibula, and patella – upper leg bone, main shin bone, small shin bone, and knee cap, respectively), and three joints (femorotibial joint, femoropatellar joint, and the tibiofibular joint – the joint where the upper leg joins with the lower leg, the joint where the knee cap joins the front part of the knee joint, and the joint where the two lower leg bones join together, respectively) , there are about five ligaments (ACL, PCL, MCL (Medial collateral ligament), LCL (Lateral Collateral Ligament), and Patellar Ligament), there are two menisci Lateral and Medial menisci, and there can be as many as seven bursae that encapsulate the knee for protection. Well not much to the average Joe who just blew out his knee but to the professional trainer/therapist it gives us a starting point and an explanation on why there are fourteen muscles that help us control knee flexion and extension. Think of the knee as a drawbridge. You have all the raw materials that make up a drawbridge the physical bridge (bones), guide wires that give it support (ligaments), the support structure that supports the shift of the earth and the impact of the cars passing over it (menisci, and bursae), and the wires that pull the drawbridge up when there is a boat passing by (muscles). Do you see if one of the draw wires are off everything else has to take on extra work? Or, if something breaks then nothing will work because the whole structure is now weak? Well the same goes for our bodies, and just like you can the bridge you can do the same for your body. Now getting on with it then, and enough of the confusing anatomy lesson. 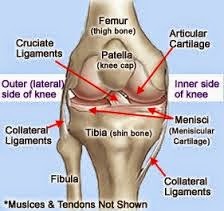 If you ever pop your ACL or PCL you will need surgery no exercise in the world can repair it. Once you have your surgery and finish the rehab provided by a physiotherapist, you will need to see a qualified personal trainer such as we have at Vio Fitness that can tailor make an exercise routine to get that knee back to working order and better. Below, I will give you guy’s three exercises that you can use to get yourself started. But first, just a little disclaimer: please, please, please if you have torn your ACL or PCL only come to us after, and I mean after, you have gotten clearance from your doctor and physiotherapist to do so. Seated Leg Extensions. These are done without any machine. Simply sit on a stool/chair with your legs at 90 degrees in front of a wall, place the bottom of your toes on the wall while your foot is on the ground and push your foot into the wall for six seconds. Repeat for 3 sets, your goal is to do 10 repetitions without any pain in your knee. Seated Leg Lifts. You may need a partner for this one. In the same position as above have your partner, or yourself, place their hand just above your knee. Their goal is to not allow you to move their hand. Your goal is to apply enough pressure into their hand where you do not feel any pain. Again, hold for six seconds, and repeat for 3 sets, your goal is to do 10 repetitions without any pain in your knee. Seated Leg Curls. Again, you will need a partner for this one and you are in the same position as the previous two exercises. This time have your partner place their foot behind your heel. Your goal is to apply enough pressure into his heel without feeling any pain. His goal is to not let you move. Hold for six seconds and repeat for 3 sets, your goal is the same as above. Once you have mastered these movements without feeling any pain, then and only then would I feel that you could possibly be able to introduce an external load like a seated leg extension machine. If you are at that point please contact us so we can look and progress you properly.